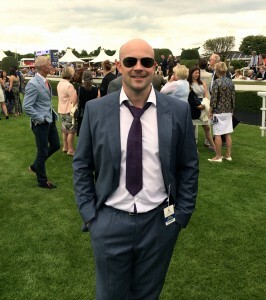 Chester Racecourse, what a trip..
Today’s post is not intended to show off or anything like that, you should know by now im not the showy type, i prefer to keep my head down and simply crack on. Todays post and photo gallery is to hopefully encourage some of you to visit the racecourse on a more regular basis. Even when your away from the computer, having a great day out at the races is still a place where money can still be made as long as you prepare before you go, and if you win you don’t spend it all on champagne. The reason why you need to do some planning before you get to the track especially during those summer months is alcohol and sunshine, mainly alcohol not the best betting partners to have by your side. 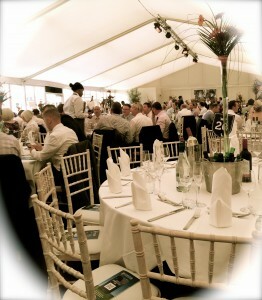 Inside a rather large marquee, makes a change from the cold North East stands. Last saturday however i was invited to Chester Racecourse and it was quite a posh event, firstly let me just say a massive big thank you to Big James Fitz from Tipster Hub & BST for my invite, and also Jeannie Chantler from Chester and Bangor racecourse who not only gave us the grand tour and made us feel super welcome, but also allow us into the parade ring. 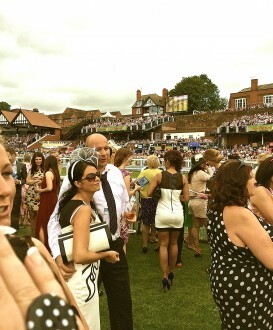 If you have not been to Chester my advice it to visit its a fantastic venue to watch racing, especially compared to my local track Newcastle, which is thankfully going to have a 10 million refurb, and the installation of an AW track which should help with more race days at the course and a much needed lick of paint to say the least. I do visit Newcastle a few times during the year and always over the winter period but the last time we went it was a bit of a joke, its kind of like they open the doors take your money and just let you get on with things, poor facilities, no TV’s in the posh end, one bar open, no patio heaters which would make the racing watchable at least, especially in the North East. It’s like they really have no clue how to host an event. Anyway back to Chester as they certainly do know what racing is all about and how to give the people what they want. Like i say its the first time ive visited and I must say i was very impressed, and im usually the, (yeah its alright type) the facilities were excellent the food fantastic and the drinks on tap flowing like liquid gold, well you can imagine. 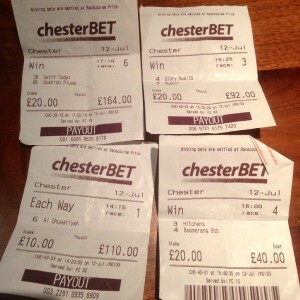 Oh and i actually managed a few bets as well, which is really the whole point behind the visit. I’ll be honest when i opened the iRace Vision software on Saturday morning, still slightly tired from the Friday night and the drive South, and without even a morning expresso to lift my sleepy spirits, i was not to impressed with the race card, lots of unexposed horses and not a great deal standing out. It does usually happen when you are at a track and you wish to work through the entire race card, it can’t all be bells and whistle selection. On days like this it can actually be a blessing in disguises as you tend to get more decent priced selections capable of winning and with a few top rated selections thrown into the mix and just a tad of good old fashioned form reading you can actually do very well. I would say i spend 20 minutes making a few picks, i left out some races mainly due to the internet dropping connection. Punters, waiting for the horses on the last turn..
Now in hindsight i should have carefully ran you through my process, but really if you load the race card for Saturday 12th July, (for those with the iRace Vision software) then just take a look and you will see it was one of those days at Chester. For me, visiting the track is for racing, the company and the refreshments shall we say come second, a very close second but still its the racing through and through for me. I’ve included my bets from Saturday and let me just say, im not sure if it was through shear excitement or the first drink which went straight to my head, but i completely screwed up my first bet. Deep in thought… Botox or no botox.. When i made my selections i knew i had a few very good chances but in the first race i just new Al Ghuwariyah would win. Even though it was a slightly hit and miss race been a Maiden Stakes, i was still confident and at 8/1 it looked like fantastic value, so i though ok £40 quid on the nose and away we go, first bet lets see. I do suggest when you are at the racecourse then its best to set your stakes, get your bets on as early as possible and just get on with enjoying the day. Its must to difficult to try and keep up with all the latest price moves and on course changes throughout the day. Leave that to days when you have no distractions and you are at home sitting at or near a computer so you can keep an eye on things if you wish. So i have no bloody idea what happened when after the horse won and won well, i thought fantastic decent win. As i made my way back to the bookies desk and produced my betting slip and handed it over i couldn’t believe my eyes. £10 quid EW… i must admit i did swear as to the shear nature of the bet, “£10 BxxxxxD quid each way…what the hell” (you can guess i didn’t use the hell word, it was a multiple vocabulary attack). As im writing this now im still sitting here shaking my head to wonder what went wrong, i can’t even blame the booze as i was only half way through my first pint. I must have been the only person in the queue unhappy to be receiving £110 quid. Top button had to go..
I’m not sure if i was distracted, or if i told the lad taking the bets and he got it wrong or what the hell happened, anyway I decided have another drink and just get the rest of my bets on and then job done. Which turned out to be the best decision as overall it turned out to be a half decent day. When we finally crawled out the races and headed off into the crowds outside the ground there were a few people collecting for Guide Dogs For The Blind, been a dog lover myself i spotted a Golden Retriever which looked exactly like my childhood dog. I headed straight over, through the tidal wave of women covered in false tan carrying their shoes. I had a chat with the dogs handler, gave the dog a pat and spoke to it in the same way people talk to babies and like someone who has never seen a dog before. Then i stuck a few notes in one of the yellow buckets, they looked quite shocked as i did, but its people like that who make a difference for people less fortunate than ourselves and besides it was the bookies money anyway and i’d had a fantastic day. This Saturday im off on my travels again, to Ripon, this time with the lads so it could get very messy, especially as ive received word the local bar is opening at 8am for us and providing bacon sarnies. Im expecting it to be more of a jolly boys outing rather than a focused betting day, however Ripon is a very good course, it might be a case of bets straight on again and sit back and relax, if thats possible out with the lads… Somehow i think not. I shall see how i get on, hopefully the weather will hold out as this weeks summer climate is due to turn to thunder and rain from what ive seen, which would spoil the weekend for more people than just me. If so i will be staying in the race bar and watching from out a window. 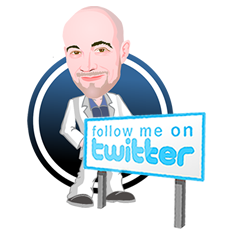 Here at iRace Vision, you’ll find a recollection of the BSG as he’s known (Betting Software Guy) thoughts and opinions based on professional experience regarding subjects and issues that are of interest to us all in the horse racing environment. Initially the blog was established as a means of bringing help and advice to people in a interesting way. 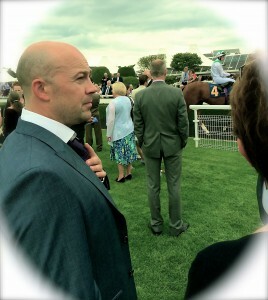 BSG is passionate about horse racing, and has gone from novice punter to self taught pro, software developer and owner over the last 15 years. 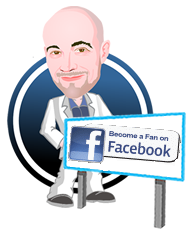 His main focus is to provide his members with the best quality horse racing software and racing advice, he has a tendency to make a lot of video tutorials and has developed a number of methods and free training over the years. If his head is not stuck in a book or reading horses form, or working on new ways to find more winning selections then he aint happy. You may find him at the race course from time to time or occasionally horse riding, however his days or ever hoping to become a jockey were delivered a cruel blow when he was introduced to the world of pastry at a young age. Feel free to take a look around and leave a comment, you can contact the BSG on the details below.